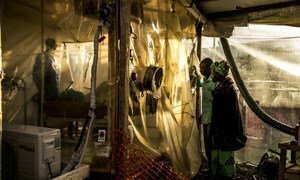 Health workers put their Personal Protective Equipment on before entering the zone where people suspected of having Ebola are held in quarantine to be monitored and treated at the Ebola Transition Centre, January 2019. Up to the end of March, more than 320 patients had recovered and been discharged from treatment centres, according to the Government’s health ministry. 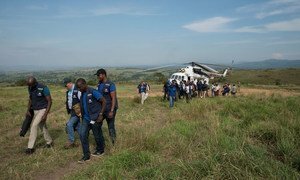 The Committee commended efforts of the Government, WHO and other partners in containing the outbreak “in a complex and difficult setting” and advised the WHO Director-General “to continue to monitor the situation closely and reconvene the Emergency Committee as needed”. Redoubling efforts to detect cases early, identify and follow up all contacts, and administer vaccinations as widely as possible. Sustaining efforts to prevent transmission and shorten the time between onset and care. Addressing the rise in cases in the remaining epicentres, notably Butembo, Katwa, Vuhovi, and Mandima. All partners to identify, target, and scale up community dialogue and participation, engagement of traditional healers, and other community engagement tactics to strengthen and broaden community acceptance. Prioritizing the safety of responders, while avoiding the securitization of the response.